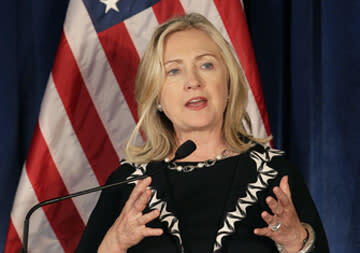 Hillary Clinton has repeatedly said she has no intention of running against President Obama in 2012. But her insistence hasn't stilled a growing wave of buyers' remorse among voters who believe the country would be better off had she been elected president in 2008. A new Bloomberg News poll released Friday finds that a third of Americans believe Clinton would have been a better president than Barack Obama. That includes a plurality—44 percent—of self-described tea party Republicans, even though a majority of tea partiers still have an unfavorable view of Clinton. By comparison, 35 percent of those polled believe the country would be worse off if John McCain had been elected president. Clinton remains the most popular political figure on the national scene, with 64 percent of those polled saying they have a "favorable" view of the Secretary of State. Obama's favorable rating is at 50 percent—even though 49 percent of those polled disapprove of the job he's doing as president. A majority of Democrats say Obama is their best candidate in 2012, though just under a third—30 percent—say they'd prefer to have someone else on the ticket.